Turbo-Accelerated slice 'n dice 'em up! A Cyberpunk Murderfest / party game, inspired by Hotline Miami and Smash TV. Brutal combat with LASERS, KATANAS and TURBO RAILS. Download the latest pre-alpha build now! Featuring Local Multiplayer and preliminary AI bots. Includes 2 characters, 2 levels and 3 exclusive Retrowave music tracks by Electric Cafe. RUTHLESS combat system: one-hit kills, katanas that deflect lasers, bombs, exploding cars, and the ultimate danger - HIT N' RUN 'EM with your FEET on the SPEED RAILS! Easy to learn but hard to master. Use the uniquely designed speed rail system to move lightning-fast from one place to another, as you decapitate and eviscerate your enemies. LOCAL MULTIPLAYER: A multitude of co-op and competitive game modes, with every one fighting for themselves or in teams. POWERUP IMBUED: Change your murdering tactics in an instant! Designed by the megacorporations, powerups allow you to move faster, drop bombs, fire more lasers, heat-seek your foes and much more! RAIL GRIND: The fast-beating heart of Gunkatana. No rails, no future! Zip along the levels at your leisure, but be careful: you can get run over! TACTICAL LASER: The merciless lasers will bounce back and kill you, but not if you know when and where to fire them. SPIN ATTACK: 360º blade attack, wreaking havoc all around. Fast and deflects lasers! Knocks people off the rails. STAB: Dashing forward, sword in hand! Slow, but breaks through the spin attack. Gunkatana is currently pre-alpha. The build available for free is a demonstration of our vision and a proof of concept. There are more characters, combat mechanics, and levels in the pipeline. Check out the local multiplayer demo now, it includes early AI bots so you can play on your own as well. We hope you enjoy your murdering experience with Gunkatana. Give us your feedback and ideas for the game, we're listening and will take them into account! We're working towards a full release on Steam! "Think multiplayer Hotline Miami with this one. 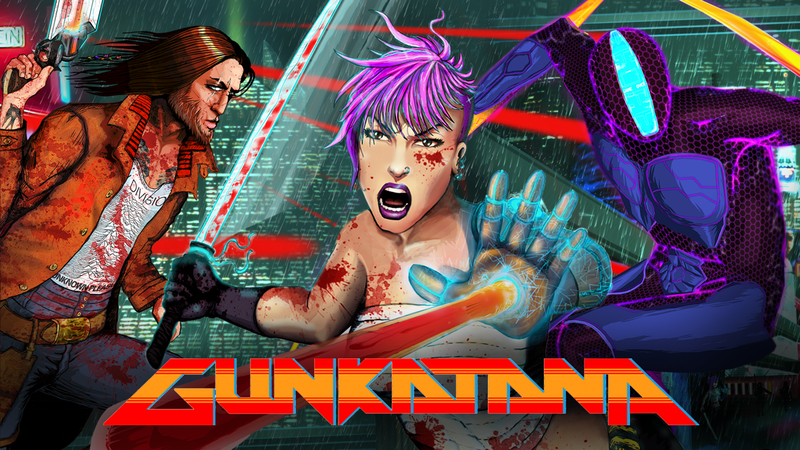 Gunkatana is neon-soaked, brutal, fast-paced, arcadey and very cool." "Gunkatana – a chaotic multiplayer shootfest, complete with grind rails." "A kind of retro-tinged mash up of Hotline Miami and Towerfall." "Each level has a series of rails which let players zoom from one place to another, allowing turbo-charged surprise kills." "Oh, what's this travelator thing? You can speed across it in a single blur? Well, I suppose that is quite cool. I'll give you that." "The soundtrack feeds into the cyberpunk atmosphere and the swift violent gameplay." "An even crazier and, to me at least, more fun Hotline Miami." "As a lover of local multiplayer games, I placed Gunkatana firmly amongst my favorites at the event." "...amazingly fun and is definitely one to watch if you like local multiplayer games." "Even as it is now, Gunkatana is a game I'd love to have in my collection." The Gunkatana death matches weren't always the slaughterfest-spectacle they are today. Some remember when it was different, when Gunkatana meant uprising and revolution. In the velas, the city's neglected shantytowns, riots turned violent as inhabitants fought for rights and citizenship. Back then, Gunkatana meant freedom. Then the megacorporations co-opted the concept and now sell it for profit. It has become a way of steering unrest and opposition into the right channels. They're siphoning off the most violent and charismatic rebels. This very first pre-alpha build features local multiplayer with two modes: Blood Credits, where you kill and steal money from other players, and classic Deathmatch. We do support Keyboard + Mouse but it's still very rudimentary. We strongly recommend Gamepads for now! Left stick to move around. The Stab attack breaks the Spin attack, and two players spinning will not kill each other. You can kill a player that is grinding the rails with lasers and the spin attack. There are bombs spawning on the map, once you have one (indicated on the HUD), press Triangle (Sony) / Y (Xbox) to drop it, and then hightail it out of there because it'll kill you too! We hope you enjoy your cyberpunk murderfest experience!